May 1st saw the sun shining brightly and cheerfully for our May day celebration! This has been a long awaited celebration by the girls, especially after reading of the May Day Celebration in the book, More All of A Kind Family. I admit, I love planning parties and I love having lots of friends in our home so I’m a pretty easy one to convince. Right now we’re in a bit of upheaval with a new roof in progress, a septic system being replaced, and a basement being insulated but we decided long ago that if we waited until our house and yard were ready to host parties, well, it just wouldn’t ever happen. So we go for it and with some tasty food, warm sunshine, super cute kids and great friends, how can you go wrong? Most of the adults hadn’t been part of a May Pole dance before and very few of the children had either. I think there may have been a little cheerful skepticism as to how it would all work out but it all worked out great. Dan fiddled the may pole parade to our little pond side paddock and through a jig for the dance. 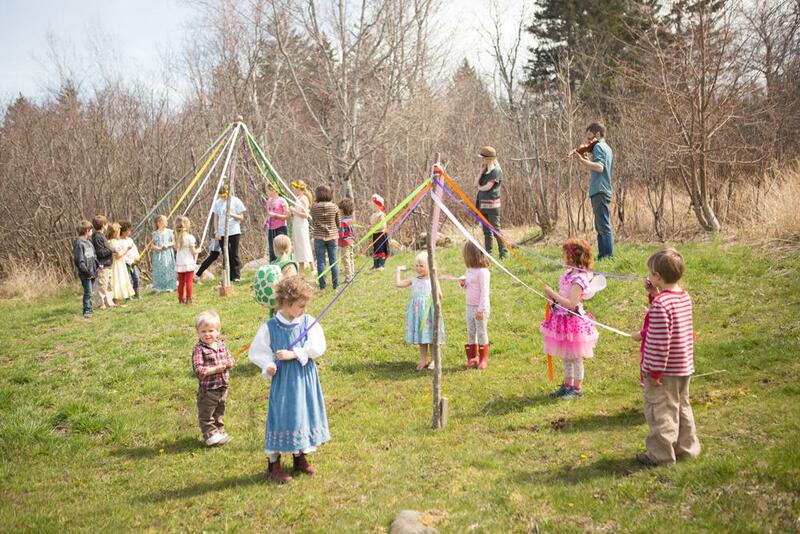 The idea is that each person holds a ribbon and moving opposite direction of the person next to them, weaves over and under to make a woven braid of ribbons on the May Pole. The older kids did that for their pole while the younger ones kept with the same direction. I figure that by the time they are in their early teens, most of these kids will have it perfected! And so May has arrived and we celebrate everything becoming green and vibrant with life once again. We celebrate warmth and friendship. Tomorrow, I turn to my freshly turned garden and begin the work of seeding and growing. Happy May, Friends!